New temporary recruitment agency? What are the vital skills you will need to succeed! Any new business venture requires energy, passion, drive and self belief. Starting a new business can feel overwhelming but with some research and planning before you begin, it can be more easily managed. Ambition and Self-motivation: You are entering a competitive industry and will need the drive and confidence to push forward. Commitment: In a competitive field you will experience rejection and will need the confidence and commitment to move forward after a setback. As with any new business, you will have to work hard and outside of typical office hours to get things done. Creative Thinking and Innovation: With any new business, it helps to think outside the box. Whether this is through your social media accounts and marketing campaigns or the way in which you manage your business and staff, any innovation can give your business an edge over your competitors. Decisiveness and Calculated Risks: Any new business is going to face challenges. The recruitment industry can be an especially high pressure environment. To succeed in such a fast-paced industry, you must be decisive, flexible, willing to take risks and respond quickly to events as they arise. 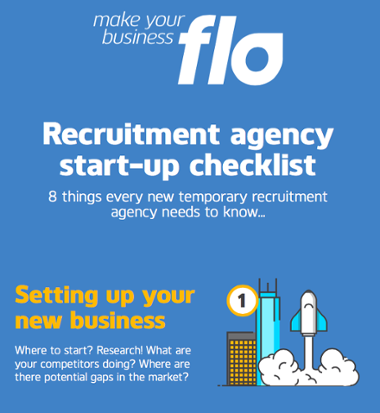 Want to know the 8 key things every new temporary recruitment agency needs to know? Click the image below to get our infographic! Sales Experience: You will need to sell your services and be confident in what you are offering. You must be comfortable working in a fast-paced, often pressurised and target driven environment. Clients and candidates may be working with other firms so you must be prepared to react quickly. Marketing and Social Media: You will not only be selling your product and services through direct contact with clients and candidates but also through your marketing campaigns and social media platforms. Customer Service: In a competitive industry, your clients and candidates always have the opportunity to look elsewhere. The way you manage these relationships and the client/candidate experience is crucial to your retention rate and growth. Interpersonal and Communication Skills: You will be working in a customer-orientated business, dealing with multiple people who require your time and attention. You should be professional and efficient in your dealings but also personable and friendly. You must feel confident meeting with different clients and candidates and should seek out networking opportunities both online and in person. You must be confident in building relationships. Written communications also play a part so ensure that emails, letters and marketing materials are well written. Every communication is a reflection on you and your new business. Practical Skills: As your business grows, you will be managing multiple clients and candidates while overseeing all other aspects of a growing business. You will need to be highly organised and plan where possible. You will be juggling the different needs of clients and candidates and dealing with the administration this brings: bookings, time sheets, invoices, contracts and much more. You will need to manage all of this while responsibly storing and managing large amounts of personal data. Being highly organised will be pivotal to your growth. Look at what is out there to support you. For example, the right software will take the burden out of managing day to day operations while helping you stay compliant. Market Knowledge: You must be well versed in all aspects of the job and what is expected of you as a new temporary recruitment agency. Understand what the role entails and what your clients and candidates expect. Although no specific training is necessary to start up your own agency, you may find it useful to take a course that offers a comprehensive overview of the recruitment industry and information on all aspects of the job. A trusted colleague or friend can help identity the existing skills you have to run your business and the areas in which you need to improve your skills. You may need to take courses to develop your knowledge and skills in a particular area or you may chose to employ staff with skills in those areas. Also, look at what competitors are doing and consider what potential areas of expertise you might need.